Looking to build a new Coffee Lake hackintosh and unsure on what parts to bring together for your for new rig? Here’s some thoughts and recommendations to help you decide. Whatever Coffee Lake CPU you buy as long as it’s an i3, i5, i7 is going to work in macOS High Sierra along with Coffee Lake’s UHD 630 integrated graphics to which sleep and wake now work with High Sierra. So with them all working which one you should buy is going depends on what exactly you want to do and how much you want to spend. I’m using an i3-8100 for web browsing, media, an i5-8600k for Photoshop, Illustrator etc, and a overclocked i7-8700k @4.9Ghz for more intensive stuff that can use extra core like FCPX, Xcode and multiple VM’s running all at once. If you overclock in BIOS you will get the same performance boost in macOS without having to do anything extra so an i5-8600k or an i7-8700k could be worth it if you want or need an addition ~15% performance on top of what you already got. If you’re stuck trying to decide between a i3-8350k and i5-8400 remember macOS is going to favor more cores on the i5-8400 while an i3-8350k is better for gaming on something like Windows. Also in April 2018 Intel released a batch of new CPU’s to which I do not recommend buying. For an extra $25-50 you only get a minor 0.1-0.2 GHz clock bump to which you would never be able to discern apart in real world performance, nor can you overclock any of the these CPU’s. So in addition to integrated graphics working on Coffee Lake UHD 630 despite no framebuffers sleep and wake also function reliability in High Sierra unlike Sky Lake/Kaby Lake. Out of the box the Coffee Lake i5 and i7 iGPU is going to work, but the i3 will require a spoof or even better a modification of the Kaby Lake frame buffers for acceleration as the i3 has a different Device ID. After the frame buffers are modified to include the i3, it will perform just as the i5 and i7 do. I’m actually typing this on a fully accelerated i3-8100 . The mod only takes 2 minutes to do, but needs to be done every time macOS is updated to a new version. The UHD 630 iGPU is a viable alternative for those who don’t want to use a graphics card, but for stability and to avoid graphical glitches with high resolution displays change the SMBIOS to iMac 18,1 in config.plist if you are using the UHD 630 integrated graphics exclusively. DisplayPort – Having a motherboard with DisplayPort is a real nice to have if you ever plan to use the iGPU weather as your primary display output or as backup just in case your graphics cards stops working in macOS. The reason you would want a motherboard with a DisplayPort or even a motherboard with HDMI 2.0 support on the rear IO is because most cheaper motherboards only come with HDMI 1.4 in which case your max resolution will be locked at 1080p60 over HDMI 1.4. ALC1220/S1220 Audio Chipset – The audio quality with the 1220 chipset is better then ALC892/ALC887 found on cheaper motherboards. don’t pack enough punch. ALC892/ALC887 isn’t as crisp sounding or is the max volume loud enough in macOS. This will be especially noticeable for headphone users like me who will be disappointed that even at max volume these cheaper audio chipsets don’t pack enough punch. When when I switch over to a motherboard with ALC1220/S1220 as it’s audio chipset and run macOS, I feel like the volume is at least ~25% louder, loud enough to hurt my ears at max volume. But this isn’t going to be a big deal if you are using external speakers where you can raise and lower the volume unlike headphones in which case ALC892/ALC887 should be fine for your needs if you don’t want to spend more. WLAN Slot – Part of owning a hackintosh is being able to use WiFi + Bluetooth for your iPhone, iPad and bluetooth devices as well has the Apple Continuity features available on macOS. To get support for these things on a hackintosh you will need to order a motherboard with WiFi and then replace the included card with a hackintosh compatible one and use this guide as a reference to enable it. Even if you don’t have a need for these features you may in the future. Skip MSI – MSI motherboard have some issues with NVRAM although they can work. I also found MSI to be more sensitive when it comes to sleep then the other three motherboard brands and won’t work if I have certain applications open. For example if I have a prompt popup in my Chrome Web Browser and try to sleep an MSI hackintosh it will immediately wake up and I’ll have to exit that prompt or close Chrome. Since it’s harder to to sleep and keep asleep I prefer the other three brands. If you really like MSI then by all means go with it, however your experience won’t be as smooth as someone with a Gigabyte or ASUS motherboard. Unlocked DVMT – Avoid motherboards that have a locked DVMT or DVMT Pre-Allocated Memory that can’t be set higher than 64MB usually found on barebones budget motherboards like the MSI Z370-A which will prevent you from using high resolution displays over the iGPU. Better support came for AMD RX 570/580, Vega 56/64 in 10.13.4 as part of Apple’s support for eGPU enclosures. Note: Vega 56/64 cooling fans may run at excessive speeds under macOS 10.13.4. If you experience this keep QuickTime open in the background and the fan speeds will drop down. If you want something cheaper or something else here’s what I can personally recommend. For Nvidia there’s some issues with lag in High Sierra which can be gotten around by using a a version of NvidiaGraphicsFixup.kext that’s patched or by using a script to install lag free versions of Nvidia Web Driver from 10,13,2. Pretty much any Nvidia Graphics card can be gotten working macOS with Nvidia’s Web Drivers although they won’t run as well as AMD with it’s native macOS support. The only Nvidia graphics card I own at the moment is the EVGA GTX 1050 Ti which I like because of it’s smallness and it’s absence of 6-8pin power connector. RAM with the same name can have different module numbers with some being compatible and others not. That is exactly what this hackintosher found out on the forums when his first ram kit caused freezing with the reason ending up being that the ram module number he originally purchased wasn’t on the QVL list and simply swapping it out from one that was one that was made the freezing go away. New to High Sierra is support for third party NVME drives that don’t have 4096 block storage like the Samsung 960 EVO NVME If you purchase an NVME die it’s recommend formatting it for the first time outside the macOS installer because as unallocated storage fresh from the factory it may not get detected. Some power supplies built earlier than 2012 may exhibit issues with sleep on macOS so it’s good to have a more recent one. From my use case here are some quiet power supplies that I’ve grown to like to which I have and do use in my hackintoshes. 79 Comments on "Coffee Lake Hackintosh Parts Guide for 2018"
Think it may be because I am on 10.13.4? Any suggestions to get this working appreciated! I saw your forums post for an i3-8100. 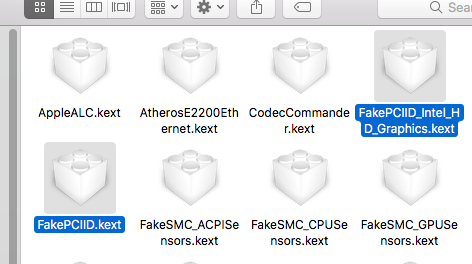 You need to change Fake ID IntelGFX = 0x3E928086 whatever apple did for 10.13.4 0x3E918086 no longer works. You also need to be using iMac 18,1. For every update you must re-follow the framebuffer edit. No, I have an 8700k, Aorus Gaming 5, GTX 970. I started with High Sierra 10.13.3 and coudln’t get nvidia drivers to work, then I saw the upgrade guide so when I did that the latest nvidia drivers work fine, but the hardware encoding is the only thing I am missing. I am wondering if in the BIOS to maybe change the graphics setting from PCIE slot 1 to IGFX just to see if it helps. Did you update shiki.kext to the latest version? What shikigva= bootflag are you using? MacX says you have no hardware encoding? When that happens it’s usually because BIOS doesn’t have iGPU enabled or Multi Monitor enabled.Primary Display to PCIe slot one when using a dGPU. My i3-8100 says I have HW encoding on 10.13.4 I can try my i7-8700k, but don’t think it will be any different. Okay, I went through the entire process again. So all kexts in the guide were latest version. DSDT patches, I added what you said to in the guide under what was already there. In Custom Flags it’s shikigva=12 not -shikigva=12 that’s your problem. Are you sure -disablegfxfirmware is in ACPI? I see that option in BOOT. What motherboard do you use? Do you need Atheros kext there as most coffee lake mobos have Intel? What installation method you have used, you went vanilla, no Beast tool or not your own EFI folder, right? In my experience none of this has to be set in Clover for iGPU acceleration working (except Intel GFX and ig-platform-id. On my Asus ROG Z370G WiFi I actually don’t use any shikigva (not needed,actually causes instability of iTunes), nor -disablegfxfirmware (causes problems with discrete GPU) and things like that. I went and changed Initial Display output to IGFX and ultimately same deal. I just had to deal with the fact that I could only get the screen to show using HDMI on the mobo. I guess I have to wait til you update the FCPX guide. No dice. I did all the steps, as well as the additional help you gave me and no hardware acceleration. Also, my BruceX score is worse than when I followed the FCPX guide. I was getting 44 seconds, now I am at 1 minute 15 at 3% so yeah. At least you are aware, and I hope some updates happen that can help. I looked into this a little more and was able to reproduce your issue. When I used the 10.13.2 Web Drivers on 10.13.4 FCPX export time was 1:50 with an i3-8100 and a GTX 1050 Ti both enabled, however when I installed the 10.13.4 Web Drivers through the Nvidia installer instead of webdriver.sh and then moved Shiki.kext & IntelGraphicsFixup.kext to /Library/Extensions and then repaired permissions the FCPX time dropped down to 0:48 seconds. I hope this helps! I’ll write this up so theres are aware. Thank you for looking into this! Does it still apply considering I have the 8700K and not the i3? I know that in clover some settings are specific to the i3. I have had the latest nvidia drivers installed. Are you going to update the FCPX guide at the end? I would gladly give it a try. Considering this is my first time hackintoshing I will await your instructions. I also found anytime I moved files to Library/Extensions in doing my testing, I would lose audio, but I will try your fix when you post with the kexts in /other and see from there. Also of note, because of the settings changed in clover, I have to keep internal graphics in BIOS enabled, otherwise I get a jumbled mess on the screen after booting the apple logo. Also, even in editing now with FCPX and doing BruceX, I see artifacts in the exports. So I have not been editing at all as a result. Oh, so same deal. I downloaded the 10.13.4 drivers from the site directly, but they were what I already had. Same deal, no hardware encoding. and thanks for the guide. I’ve built my new rig following your previous guide about the GIGABYTE Aorus z370 gaming 7 + intel i7. The only thing it seems I cannot get to be working is the dual monitor configuration (using the integrated card, it works on windows). I’m posting this here cause it seems that all of this motherboards share the same intel uhd 630 integrated graphics, so it could be a common issue..
That’s an issue with integrated graphics, you’ll need to plug in the second display after booting to get detection. Thanks for the feedback! I’ve read about this but it seems that in my case that doesn’t work either.. have you tried plugging in the second display after boot on the aorus gaming 7 build? Hi, I really want the RX 580 because of compatibility but I don’t need that much power, How hard is it to get the Gigabyte RX 560 working? and should i buy the Gaming OC or the OC edition? RX 560 is natively supported too! I’m using MSI Aero ITX RX560 4GB and it works flawlessly. Any good b360m board? Don’t wanna spend that much money on z370 paring with non-k processors. Yes you will want to purchase Intel because Ryzen is more difficult to get working and wont work as well if your primary use is going to be a hackitnosh. I’m sure you get a ton of spammy submissions so I’ll get straight to the point – I’d love to submit a guest post or sponsored post for publishing on your site. If you accept sponsored or guest post on your site, please let me know price for publishing a post on your website. I’ve a MSI Z270i Carbon Pro AC and I’m not satisfied with this motherboard on hackintosh. Poor sleep management with Chrome, like you, mismanagement of NVRAM. Require to go through OsxAptioFix2Drv-free2000.efi and EmuVariableUefi-64.efi. I have an i5 7400. I will change my motherboard. What is the most interresting? Change to a Z370 (I always take Z series in case I change for an overclock processor) and therefore change the processor for a i3 8100 or i5 8400 or only change the motherboard by taking an Asrock or ASUS? Do you think I would see a big difference between Kaby Lake or Coffee Lake? For Coffee Lake, do you recommend Gigabyte again? On Kaby Lake, you will not recommend. Are they good or you don’t have a step back? Will there be kernel task problems for the disk? Whether Z270 or Z370 I am looking for a motherboard that manages very well sleep, USB, NVRAM and a last important point, I use Power Nap. Which motherboard do you advise me please in Z270 or Z370 mini-itx. If you want to stick with Kaby Lake I was very happy with my ASUS Z270i, to which I used as my main build before Coffee Lake came out https://www.amazon.com/ROG-Strix-Z270I-Gaming-Motherboards/dp/B01MZBUDUU/?tag=hkntshr-20 a big different from the MSI Z270i Carbon that I also had at one time. The reason for that is that a device id injection is required for an i3 as the UHD 630 it has is slightly different than the i5/i7 and that may cause unforeseen issues. Although I haven’t had any trouble there might be an app or something that I don’t use that can cause issues because of an i3 being used. In the end if I summarize well, for Kaby Lake, I can take the Asus ROG Strix Z270i https://www.amazon.com/ROG-Strix-Z270I-Gaming-Motherboards/dp/B01MZBUDUU/?tag=hkntshr-20 and if I go on Coffee Lake I take an i5 8400. Not wanting to Gigabyte (I work for a computer assembler and Gigabyte one of big concerns of after sales service on their product, defective motherboards, fans on graphics cards badly calibrated for the 0db, Huge Coil Whine on their graphics cards), in your opinion, can I stay on an Asus ROG Strix Z370i https://www.amazon.com/Z370-I-mini-ITX-Motherboard-Generation-Intel-Core-Processors/dp/B075RJ16BQ/ / ? Would I have the same results and qualities as in Kaby Lake? And Asrock, as I understand the Fatal1ty do not handle Power Nap well? Yes early on the Z370i had some issues, but ASUS seemed to have fixed it with BIOS releases and the reviews have improved because of that, you should get the same performance. If you don’t plan to use a graphics card I recommend Coffee Lake a major difference between Coffee Lake and Kaby Lake is that sleep/wake works with integrated graphics on Coffee Lake while on Kaby Lake or Sky Lake it does not. ASRock does have issues with handling deep sleep and as a result have complained of there hackintosh restarting in sleep, but you can disable that in Terminal. With ASRock there have also been reports of the hackintosh just restarting while they were the in the middle of using it with no kernel panic info to back up the reason why, but only a handful of people have said this. For Asrock, I would not take, I use deep sleep. Well, the Strix 270i is not for me, there is no internal USB 2.0 connector (I use the Corsair LINK Lighting Node Pro with RGB LED strips). It’s bizzare, I do not know why they did not put it, while on models Z370i, H270i and B360i they put it. In the end, if I do not like Gigabyte, there is only Kaby Lake mini-itx left with the GA-Z270N-WIFI and GA-H270N-WIFI, hoping not to have kernel worries about disk or QC. These are basic models, I think maybe it will be good. Otherwise for Coffee Lake, I can finally go on the one you recommend in Gigabyte, even if I’m not a fan of the Z370N-WIFI https://www.amazon.com/GIGABYTE-Z370N-WIFI-Bifurcation-Motherboard/ dp / B076VD4XV4 /? tag = hkntshr-20, there H370N-WIFI or the B360N-WIFI. There are also the 3 mini-itx models Asus Strix Z370i, H270i and B360i. What do you think ? The models mentioned in Kaby Lake or Coffee Lake will not cause me any problems? I want in the end that it is the most possible OOB. Otherwise it’s bizzare your worries with the ASUS Z370-G and the USB 3.1, like what from one motherboard to another of the same brand everything can change. Did you try AptioMemoryFix.efi instead of OsxAptioFix2Drv-free2000.efi? I am using an MSI z370 M5 Gaming and NVRAM works fine with it. No more need for EmuVariableUefi-64.efi. I can’t comment on sleep though. The driver for my external soundcard causes kernel panics when sleeping……..
I’m planning on using the EFI from the ASRock z370 guide from earlier in the year but since I will be installing OSX 10.13.4 I assume I should go though and update all of the included kext files to the latest version. Is this sound thinking? I recommended following the Vanilla Guide over at the hackintosh sub-reddit. Use hackintosher’s EFI as a reference point, but don’t treat it as gospel. Some things have changed since hackintosher posted it. You probably won’t need all the kexts that the EFI contains. And definitely have the latest version of Clover and the kexts. I have an i5-8400 and an Asrock Z370 Pro4 and it’s working well. Hi Zoltan. I’m thinking of buying the ASRock Z370 Pro4 as well. I noticed it doesn’t have a WLAN slot. Are you getting Wifi/Bluetooth? If so, how? I’m using the TP-Link Archer T9E AC1900 PCIe Adapter for WiFi and GMYLE Ultra-Mini USB Broadcom BCM20702 (Bluetooth V4.0) dongle for bluetooth. The TP-Link Archer has been fantastic. It worked out of the box and my speeds have been great. The GMYLE bluetooth dongle works fine but it has short range. However, I don’t use Bluetooth much and I’m not a fan of wireless keyboards and mice. If bluetooth reliability and range is super important to you and you’ll be using bluetooth all the time, you might be better off getting one of those Broadcom wifi/bluetooth combo cards for hackintoshes. Hi, this site is so cool! Thanks for all this Information! And Motherboard is my problem. I’m not sure if Asus or Gigabyte. And why you prefer the Aorus Gaming 5 to the 7? I want a stable System, for Final Cut and Cinema 4D. And maybe i want tu use 2x Apple Thuderbolt Display, so i need the TB Header. Is this right? Which one can you recommend and why? When i plug a Thunderbolt Apple Display into the PCIe Adapter, does all work fine? cam, audio, usb on the display? Thanks a lot and sorry for my english am my lot question. I would suggest adding a note to the storage section to explicitly dissuade people from using the new Samsung 970 EVO/PRO SSDs and PM981, the OEM version of the 970 EVO. The retail 970 drives were just released with slightly better performance, and more importantly, Samsung dropped the MSRP on them compared to the 960 series. So people might be tempted to buy them, being used to the idea that storage drives are standardized and anything should just work (which is true in most cases), but for a Hackintosh these drives do not work. I spent hours trying to figure out why the macOS installer would reboot on the second phase (booting from SSD) before figuring out it was due to the PM981. Thankfully I had an PM961 (OEM version of the 960 EVO) being used in another computer that I was able to clone onto the PM981 and use instead, and that worked perfectly. How is your PM981 working? I’ve just discovered my laptop has it as well after a week of unsuccessful trials of installing (rebooting on a second phase). So now I am running macOS from external drive and we’re working on nvme kext to behave normally without panics. Can you conclude that it is stable on your system after all? Any suggestions for how to get macOS to sleep/shutdown/restart correctly on a Gigabyte Z370 AORUS Gaming 5 motherboard? Specifically I seem to sometimes lose the ability to use my USB keyboard after reboots, even though it’s plugged directly into the motherboard’s peripheral headers. The motherboard LEDs also stay on after shutting down or putting macOS to sleep, and the only way to get them to go off is to shut down and then cut power via the PSU switch. Conversely, Windows seems to shut the motherboard LEDs off without issue. I’ve had that keyboard issue with various kinds of motherboards but there almost always MSI and it only happens with a specific CM keyboard, do you have another that you can test? The reason the lights are staying on during sleep is because of FixShutdown in config.plist. If you uncheck it then it will go away but shutdown will cause a restart. Some have reported that toggling ErP in BIOS always then to shutdown Gigabyte motherboards without FixShutdown, but I wasn’t able to reproduce that. The best solution I can think of is to simply disable RGB fusion in BIOS. Hello from Germany. First, thanks for all your informations and guides. I’d like to build my own Hackingtosh next month. I’ll use it only for web browsing, media, Lightroom and a few little thinks in Photoshop. You wrote, that you are using the i5 8600k in your Photoshop Hackingtosh. Is it correct? Are you using the integrated Graphics UHD 630? What other components are you using? Asus Z370-A Prime looks promising too.i also saw in your parts guide 2018 it is mentioned as a supported motherboard. can we use this same EFI for this motherboard? I would go with that one If I was going for a new build. Shouldn’t be a problem. Thanks for the Feedback going with your recommendation of the Z370N WIFI board. My question is the board comes with Intels 2×2 802.11ac wifi built into the board. My questions is does this unit actually reveal a WIFI card that can be replaced on the motherboard or do I need to install a fully supported PCI card with a wifi Card in the provided slot? I have watched and read the wifi guide but not sure how it applies here. Thanks in advance. Hi and thanks for the precius informations! 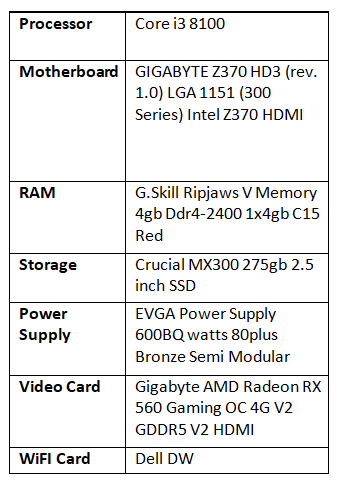 could work as well… from specs (https://www.gigabyte.com/Motherboard/Z370-HD3-rev-10#kf VS https://www.gigabyte.com/Motherboard/Z370P-D3-rev-10#sp) they seem pretty similar to me… but the second one in my country (italy) costs more then 90$ less. What do you guys think? Yes the Z370P D3 can work I didn’t include it because in the US they are priced very similarly. would you think this build will work? Thank you! Is it better to get 2x 500gb m.2 ssd then getting 1x 1tb and partition it? Everything gone good with High Sierra 10.13.6 . But Still not able to enable 2nd monitor via gpu or cpu. Tried on board’s HDMI and DVI . and also Gpu’s Dvi. Please help for this issue. Can I use an i7-8086K cpu without issues? Hey, thanks for the guide. How would I format an m.2 ahead of the install? I’m currently on a Mac Mini. Thanks! Thank you for great tutorial. I have installed my mackintosh, it works great, but… the system info shows me that the processor is “unknown”. Is it possible to show my i7-8700K or should it stay like it? Is it important? It’s just cosmetic and has been fixed by Apple in Mojave 10.14 so don’t worry about it. Thank you! This website is amazing. What do you think about the T processors like the i5 8600T? Any problems? I really like the 25W TDP. Its 35W, my mistake, but still great. On the GIGABYTE Z370 AORUS Gaming 5, can the on board wifi be replaced with the DW1560, or should I look at a USB wifi card? If so, any suggestions? Everything else is working great, but not a fan of rj45 plugs. Hey thank you for the buyers guide – as it seems this one is more up2date than tonymac. Hi，what about GIGABYTE-Z370-UD3H? will that work? I noticed there’s DisplayPort on it. I want to build my hackintosh with i7 8700 (iGPU), and 27’4K display. Yea it will definitely work.